When tumor cells begin to invade surrounding tissues and move to distant sites, they become deadly. The molecular details of the invasive “switch” — the series of signaling events that turn on a tumor cell’s invasive behavior — are not clear. “Ideally, we would like to have a molecular signature from a tumor, for example gene expression or signaling data, to be able to predict whether a tumor is going to be aggressive or not, to guide treatment decisions,” said Alissa Weaver, M.D., Ph.D., associate professor of Cancer Biology. 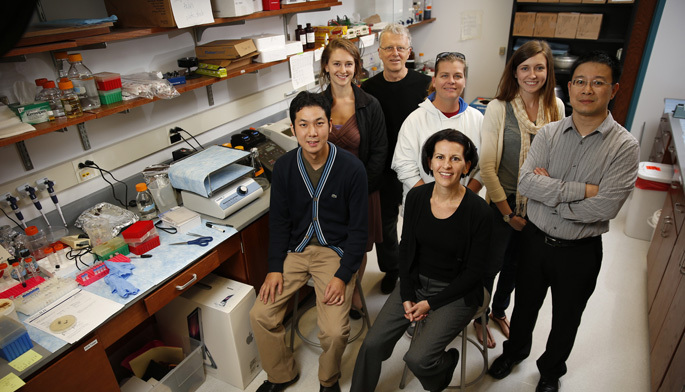 Weaver and her colleagues in the Vanderbilt-Ingram Cancer Center and the Department of Biomedical Informatics used computational modeling and experimental studies to identify how two key components of the invasive switch, the proteins PI3-kinase and PKC-alpha, work together. Their findings, reported in the journal Science Signaling, are a first step in efforts to develop a predictive signature of tumor aggressiveness. To probe signaling states that induce an invasive phenotype, Weaver and her colleagues chose to focus on the ability of cells to degrade extracellular matrix – the supportive meshwork of proteins and carbohydrates that surrounds cells. Matrix degradation, Weaver said, “is universally upregulated in invasive cancers,” and it happens where cellular structures called invadopodia — finger-like “drills” — secrete matrix-degrading enzymes. Weaver and her colleagues decided to compare invadopodia to focal adhesions, cellular structures that use many of the same molecules as invadopodia, but do not have strong matrix-degrading activity. Based on published data, the researchers defined networks of proteins involved in focal adhesions and invadopodia. Then they used computational approaches to identify interactions between molecules in the network, which pointed to a number of highly connected molecules — “hubs” — in both networks. To prioritize these molecules for further study, the researchers analyzed signaling data from human head and neck cancers and looked for network hub proteins among the signaling molecules associated with the most aggressive tumors. The combined approaches revealed a set of shared molecules, and the team decided to focus on PI3-kinase and PKC-alpha. Using cell lines derived from head and neck cancer, breast cancer and melanoma, Weaver and colleagues examined the relationship between PI3-kinase and PKC-alpha by manipulating these proteins singly or together. They found that activation of PI3-kinase promotes invadopodia formation, which is consistent with recent data from other laboratories. Manipulation of PKC-alpha had unexpected and opposite effects, depending on the PI3-kinase activity in the cells. In cells with regulated (normal) PI3-kinase activity, PKC-alpha enhanced invadopodia formation. But in cancer cells with deregulated (activated) PI3-kinase, which is a common alteration in cancer, PKC-alpha inhibited invadopodia formation. The researchers then demonstrated that PKC-alpha directly limits PI3-kinase activity and subsequent invadopodia formation (a negative feedback loop). Negative feedback loops that keep cells in check are frequently inactivated in cancer, Weaver said. The finding that PKC-alpha is an important negative regulator of PI3-kinase activity in cells with overly active PI3-kinase suggests that the combination of high PI3-kinase and low PKC-alpha could potentially be used as a biomarker for cancer aggressiveness. In addition, the new data indicate that this feedback loop specifically controls invasive behavior. Research collaborators included first author Daisuke Hoshino, Jerome Jourquin, S. Weller Emmons, Tyne Miller, Margalit Goldgof, Kaitlin Costello, Darren Tyson, Brandee Brown, Yiling Lu, Nagendra Prasad, Bing Zhang, Gordon Mills, Wendell Yarbrough, Vito Quaranta and Motoharu Seiki. The research was supported by grants from the National Cancer Institute (CA113007, CA016672, CA112970) and the National Institute of General Medical Sciences (GM088822, GM075126) of the National Institutes of Health. An endowment to the Barry Baker Laboratory for Head and Neck Oncology and to Vanderbilt-Ingram by the Robert J. and Helen C. Kleberg Foundation also supported the studies.